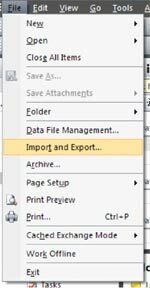 If you are using Outlook and you want to backup or save your e‐mail you can use the Import and Export tool in Outlook. Select “Import and Export” from the ‘File’ menu. Select “Export to a file” from the list that appears and click “Next”. 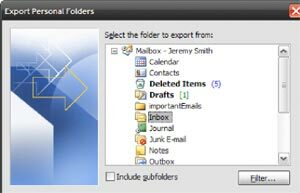 Select “Personal Folder File(.pst)” from the list that appears and click “Next”. From here you should be able to select the e‐mail box that you want to back up. Select “Inbox”, as shown in the image below, to back up the e‐mail in your inbox. You will then see a box that says, “Save exported File As”. That is it; you have successfully backed your e‐mail up. Below you can see how to import e-mail that has been backed up. So you have backed up your e‐mail, now you want to restore it. Follow the steps below to import e‐mail back into outlook. Select “Import and Export” from the File menu. Select “Import from another program or file” from the dropdown list and click “Next”. Select “Personal Folder File” (.pst). You will see a window that will ask you what file that you want to import. This is where you will find the file that you saved in the “backup your e‐mail” section of this site. If you follow these steps your e‐mail should be imported – you can use this to transfer old mail from computer to computer – like if you are getting a new computer but you want all of your old e‐mails.